THE FOUNDER of the National Democratic Congress (NDC), Flt. Lt. Jerry John Rawlings, has cautioned the supporters of the NDC not to get angry with the people in the Central Region for not voting for Prof. John Evans Atta Mills in the just ended elections. He said the reason why the voting pattern did not go in favour of the NDC for that matter the presidential candidate was because the New Patriotic Party (NPP) has deliberately stolen the elections to discredit Prof. Mills, the former presidential candidate who hails from the Central Region. “I heard that some of you were angry with the people of Central region. Don't get angry with them. If you get angry with them, it means you don't understand the whole chemistry or the concept of what went on in the region. Don't make such mistake. A lot of money was sent to the region. The main reason why it happened so was that the NPP intentionally stole the elections to discredit Prof. Mills,” he told the gathering of teeming supporters of the NDC at a thanksgiving rally held over the weekend. According to the former president, he was vindicated about his warnings to the NDC supporters to be vigilant because the NPP hatchet plans to rig the elections. “Before the elections, you will recollect that I told you that when it was about 3am to 4am, you should line up to protect the ballot boxes but you don't believe me. Before President Kufuor held their last rally, they brought a police officer on GTV to broadcast that as soon as you finish voting, all of you should go home. These were the plans to prepare the grounds for their attempts to rig the elections and again you will recollect that during their last rally, President Kufuor brought his own wife to admonish you that you should go home after voting, that was the point that they wanted to misbehave and immediately the realized that the plans could not materialized they decided to rig it before the end,” he alleged. Flt. Lt. Rawlings told the supporters that the NDC has commissioned an investigation committee to collate the results from various constituencies. He described the actions and roles played by sections of the NDC supporters in Odododiodio who he termed them as militants to resist any attempt by the NPP to rig the elections as positive defiance. Speaking on the assertions that he cannot wait in opposition in the next four years, the former president stated that, that statement was the only truth that have been told about him, adding that what he meant that he cannot wait for 2008, was immediate justice for the ordinary but not to wait until the NDC comes into power. He continued, “In 2001, I went to Kumasi and I said positive defiance, they distorted it and people did not understand it. All that I am saying is that as far as justice is concern, I will not wait for Mr. Kufour to be voted out for our government to come in before justice could be done. A constitutional rule with the judiciary in process, it must be able to give me justice today and now,” adding that if the nation will wait for 2008 for the NDC to allow justice to prevails, then the democracy that the nations is practicing is meaningless. 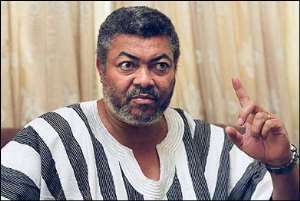 The former President Rawlings who asserted that he wanted immediate justice from the judiciary for ordinary people including, the murder of Ya-Na Andani and Alhaji Mobila's family, commended Justice Apau for his ruling involving a deportee to Liberia by the BNI and noted that the case of Alhaji Mobila among others were an indictment on the part of chiefs, religious leaders the government, and other institutions. He said if justice could be done to the victims he mentioned above, President Kufour can reign for 20years. According to him, the inability of the government to bring perpetrators of the gruesome murder of Alhaji Mobilla, to book and banish the culprits amounted to an indictment on government, bishops, chiefs and Priest.